SAP and Diageo hit the headlines when the High Court ruled that SAP had the legal right to pursue Diageo for up to £55 Million in damages for something termed Indirect Usage. Any SAP customer that has third party systems interacting with their SAP landscape could potentially be liable to major unbudgeted costs. This webinar will define what Indirect Usage is and discuss why SAP are actively pursuing this as an additional source of revenue. Furthermore, it will present a step by step plan for mitigating against the very serious financial risk that SAP Indirect Usage poses to organisations. Join Snow Software and PwC for a lively and informative conversation about managing your Oracle software footprint. Keeping on top of SAP® licensing is a time-consuming and complex task, and the correlation between licenses defined in a contract versus technical entitlement to use the SAP system has always been open to interpretation. The need to license third-party applications which indirectly access the SAP system only adds to that complexity. Find out how to proactively address the most common pitfalls of an audit. Don’t walk into unexpected audit fines! Make sure you’re prepared and reduce the risk. By 25 May 2018, less than 50% of all organizations will fully comply with the EU's GDPR says Gartner. Snow Software and Deloitte have joined forces to help you accelerate your path to GDPR compliance. •How to use reporting to prove another key GDPR requirement - technical and organizational measures (TOMS) to ensure a level of security appropriate to the risk. Bis zum 25. Mai 2018 werden weniger als 50% aller Organisationen die GDPR der EU vollständig einhalten, sagt Gartner. Snow Software und Deloitte unterstützen Sie gerne gemeinsam auf Ihrem Weg zur Einhaltung der EU-Datenschutzgrundverordnung (DSGVO, engl. GDPR). •Wie erhalten Sie Transparenz über die Geschäftsprozesse und IT-Applikationen mit personenbezogenen Daten (On Premise, Cloud-basiert oder mobile Apps)? •Wie können Sie wesentliche zusätzliche Informationen über diese IT-Applikationen nutzen, um eine der Kernanforderungen der DSGVO, die Erstellung eines Verzeichnisses der Verarbeitungstätigkeiten, zu erfüllen? •Wie können Sie Reports nutzen, um weitere Kernanforderungen aus der DSGVO zu belegen, v.a. die technischen und organisatorischen Schutzmaßnahmen (TOMs) für ein angemessenes Schutzniveau für personenbezogene Daten? O licenciamento SAP é complexo e as definições contratuais são difíceis de interpretar. Além da complexidade, falta de visibilidade e atividade dos usuários no sistema SAP, faz com que seja um desafio para alocar o tipo de licença correta. O Elvis Martins, palestrante do webex pela parte da Snow, é um auditor de licenciamento SAP. Mais recentemente ele tem vindo a aconselhar os clientes em como otimizar os seus ativos. Também contaremos com a presença do Marcelo Lira, responsável pela área de Contract Compliance Services & Risk Consulting na KPMG. Putting a Software Asset Management program in place requires a substantial and sustained commitment on behalf of an enterprise. This involves putting in place controls and processes to assure best practices, the purchase and integration of a SAM platform for managing on-premise desktop and data center software, PCs, laptops and mobile devices, as well as Cloud and SaaS software subscriptions. Determining what the return from this investment is a key consideration for most organizations today. John Burleson will show tools in practice today to estimate the returns from this effort, and show case studies that have in real-life played out to produce demonstrable and calculable returns. Together with our partner b.lay we tackle the fundamental aspects our customers face during an Oracle audit. It is no secret that most software publishers now have software audit practices and some are aggressively pushing license compliance audits as part of their revenue model. Gartner states that 68% of organizations experience two or more audits annually so it’s best to be well prepared. This webinar will cover key aspects of the Oracle Audit process and understanding the real deal of the cloud resolution offered in case of a non-compliance situation. Three-quarters of IT and finance leaders fear a software audit by Microsoft. More than Oracle, IBM or SAP. In fact, 68% say they have been audited by the world’s largest software publisher in the last 12 months alone* and this looks set to increase. But software audits don’t need to be scary if you’re armed with the right information and insight. Join Microsoft licensing guru, Rich Gibbons from ITAM Review and compliance pros from the world’s leading SAM technology provider, Snow Software, for a 45-minute masterclass in Microsoft audit readiness. Sabemos que gerenciar os ativos de software das organizações sempre foi uma tarefa desafiadora por conta da complexidade das métricas de licenciamento dos fabricantes e a Transformação Digital pode piorar ainda mais esse cenário. Participe do Webinar e aprenda os passos necessários para ter sucesso nas Auditorias de software. SAP’s end of year is approaching fast and it is aggressively pushing customers to transition over to its next generation SAP technologies. This is a unique opportunity for you to strike a hard bargain over your move to S/4HANA by leveraging your current licensing position and annual maintenance costs. •Is it fit for purpose? Have you considered how Snow could help you to reduce the risk of your SAP software estate? In episode 2 we explore how to mitigate the risk of indirect usage. SAP customers are becoming increasingly exposed to financial risk through audits, particularly where third-party applications and add-ons indirectly access and use SAP data. This type of access is known as Indirect Usage. Elke organisatie die zakendoet in Europa moet zich uiterlijk in mei 2018 houden aan de General Data Protection Regulation (GDPR) wetgeving, anders kunnen ze worden geconfronteerd met boetes die oplopen tot 20 miljoen euro of 4 procent van de wereldwijde jaarlijkse omzet. Gartner voorspelt dat 50%1 van de organisaties hier klaar voor is. - Hoeveel devices heeft uw organisatie? - Waar zijn deze devices en wie heeft hier toegang toe? - Zit er op deze devices een data encryption en een anti-virus programma geïnstalleerd? - Welke applicaties zijn geïnstalleerd op iedere devices en bezit deze persoonlijke data? - Welke Cloud applicaties en services zijn in gebruik? Schrijf u vandaag nog in voor het Webinar GDPR wees voorbereidt voor mei 2018! SAP customers are becoming increasingly exposed to financial risk through audits, particularly where third party applications and add-ons indirectly access and use SAP data. In this webinar, we explain how some of the recent amendments to SAP’s terms and conditions might lead to further exposure for your organization. You will learn how to efficiently highlight activity in the SAP system to identify where Indirect Usage may be taking place and what to do about it. Don’t walk your organization into a hefty audit fine! Make sure that you’re fully prepared and reduce your exposure to a minimum. If you are preparing to submit your LAW Report or getting ready for an SAP audit you need to ensure your SAP License estate is optimised prior to any new purchase. Utilising the Snow Optimiser for SAP software, Snow Software’s Baseline to Audit (B2A) project service enables SAP customers to rapidly determine the true status of their SAP license position prior to any negotiation with SAP. •Best practices from other successful organizations such as Carnival and Sky. The complexity of getting visibility and control on your IT spend will only increase in the coming year. Comply with the licensing of software vendors is an absolute must, but not an easy task. 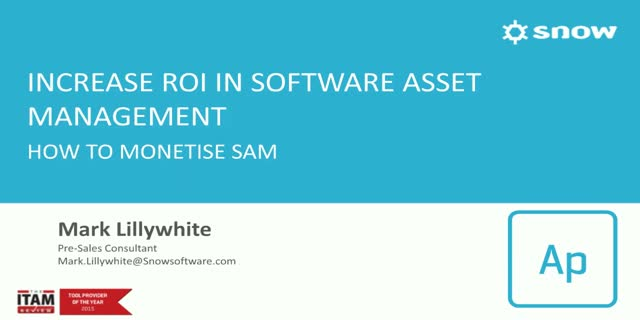 While your IT landscape is evolving continuously it has a huge impact on how you should deal with Software Asset Management (SAM). What are the key developments you must take in 2017? During this one-hour webinar we will go into details on how these trends impact your daily job and how Deloitte and Snow Software can help you battle these trends. Cloud solutions offer many benefits. But the ease with which business units can now select and implement Software-as-a-Service applications and Infrastructure-as-a-Service platforms, without the involvement of IT, has created a visibility challenge for the CIO and the IT function. The more people that initiate IT spend the more opportunity there is for overspend through duplication, missed opportunities for volume purchasing and shelfware. A lack of insight into rapidly increasing SaaS and IaaS consumption makes them less able to partner with business units and assume their role as influencer over all technology usage and spend. • Explore the shift in IT spend and how it is driving the need for CIOs to redefine themselves as the Chief Influence Officer. • Show how you can retain control of costs, optimization and risk in your IT operations. Start re-shaping your role in digital business today. To address this, Snow provides Software Asset Management (SAM) solutions designed to ensure that the $320 billion spent every year on enterprise software is money well spent – ensuring organizations have the appropriate licenses for the software they use – not too many, not too few. More than 6,000 organizations worldwide rely on Snow to optimize licensing across in excess of ten million devices, from the mobile to desktop, datacenter to the cloud.